I’m about to get real with you all. As a designer, it’s all well and good for me to come up with creative design ideas and think of different concepts for printing, paper textures and finishings. But it’s not always as simple as coming up with an idea, getting it printed and sending it out. I also have to find the right printer and finisher who understands my concepts and can fulfil it to the highest standard. Budget is also a priority, so trying to find the best of the best printer at the lowest cost can always prove to be a challenge. So how do I overcome all of these obstacles? Let me tell you a story about how I designed, printed and sent 3 different styles of invitations on a budget with all the bells and whistles, in less than 6 months! Warning: it was not smooth sailing. For our first set of invitations, I decided to go for a very simple minimalist design. As a wedding invitation designer, I had an inkling that our guests would expect something crazy and wow that would burst in their face as they opened them. So I hit them with that soft and muted style to keep them on their toes. 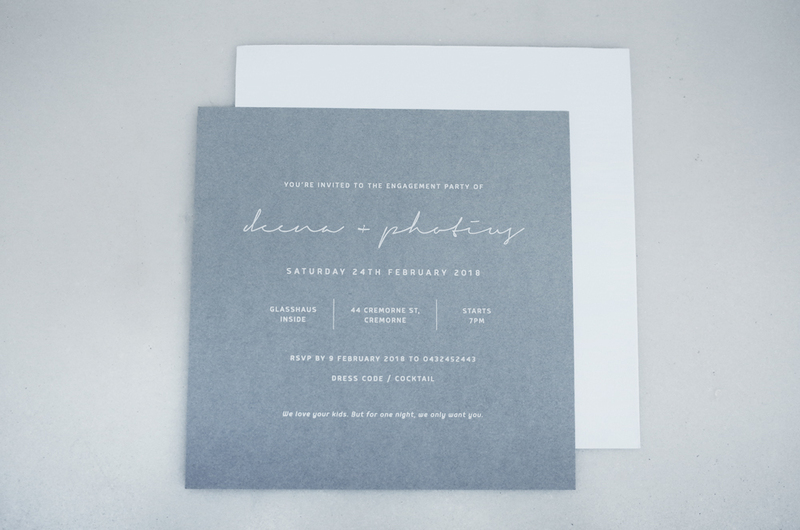 I wanted simple, but of course I couldn't just go with the obvious black and white, so I chose a cool ice grey card with white ink print for the the invitations and for the envelope I reversed the colours to give it a bit of contrast and went with a white envelope and grey type. Monochrome minimalism at its best. I was a little short on time with these invitations, so I went with a large trustworthy printing company as I had no time for hiccups. As expected. I sent my artwork, the files were printed, and I had these babies in my hot little hands in less than a week. Of course going with a larger company isn’t always the cheapest option, but for the quality and peace of mind, it’s definitely worth the money. 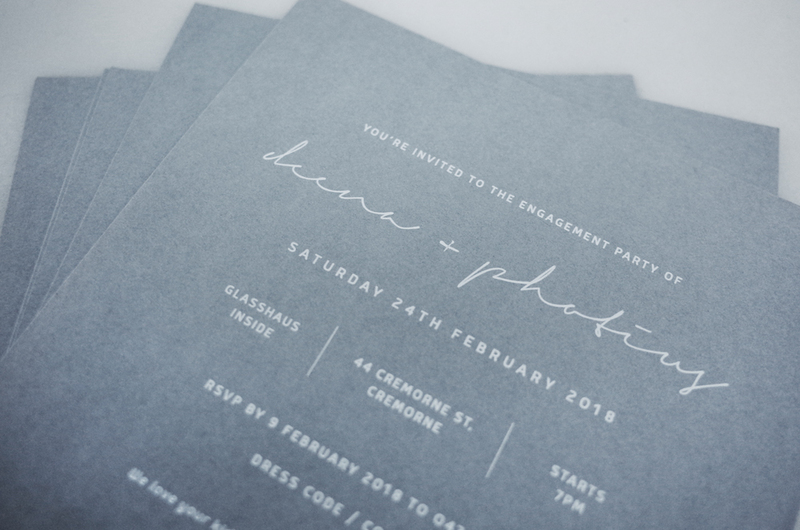 So after the no fuss printing of the minimalist engagement invitations, I wanted to hit my guests with the wow factor for destination wedding #1. I designed invitations that had all the bells and whistles. Gold foiling, embossing, debossing, digital printing, gold swivel eyelets, custom die-cuts, folds, flips... THE LOT! The only trouble was, I needed to print 500 of these incredibly technical invitations. To top it off, this was going to be a HUGE destination wedding where most of the guests resided in Indonesia, so I had to print 100 invitations in English for Australia and 400 invitations in Indonesian for Indonesia. I searched high and low to source a printer that could bring my designs to life without the hefty price tag, and found the cheapest way was to go through China. I had exactly 1 and a half months to have these invitations printed and sent before my flight to Indonesia. Everything started off all smooth sailing. Communication was perfect and they understood exactly what needed to be done. We set a timeline of 2 weeks to turn around the printing and allowed 1 week to ship, which gave me plenty of time to collate and send all of the invitations out. So far, China has been amazing. Fast forward 2 weeks. Communication breaks down and printing's not looking good. I am frantically emailing back and forth to have measurements fixed, colours fixed, fixtures fixed. And after everything was fixed, I had to get it all re-fixed because the thing that needed fixing wasn't actually fixed. Fast forward another 2 weeks. We finally get it right. Invitations are shipped and I now wait impatiently for my invitations to arrive. Fast forward another week and the invitations arrive! The english invitations are here, but the Indonesian invitations are nowhere to be found... EEEP! I spend the next week sending out english invitations in Australia while trying to find a last minute solution to get 400 invitations printed ASAP before my flight out to Indonesia. We pulled some strings and managed to find an amazing printer in Indonesia who was kind enough to turn around our invitations in 1 week. I took my flight to Indonesia and 1 week later, all of the invitations were at my door. Needless to say, going cheap can be great for the pocket, but can be more of a headache in the long run. However in this case, the craziness was all worth it in the end as the invitations turned out amazing. Beautiful rich colour with the traditional Javanese pattern throughout. The gold foil details finished everything off perfectly. The printers in Indonesia did such an amazing job with reprinting these invitations for us, that we decided to use them for our final wedding celebration in Greece. But of course, life has its own plans and everything changed... again. So finally we come to the final wedding invitation. Destination wedding #2 - Greece. So after having the designs ready to go for almost 2 months, we finally had the numbers to get these beauties printed. But because of the short notice, we couldn't go back to our beloved printer in Indonesia. So, back to the drawing board. We eventually stumbled across a brand new letterpress printer in Australia, producing high quality printing at reasonable prices... Hallelujah! It can always be hit or miss with brand new small businesses as you don't have any reviews to go by. However, from seeing the quality of work they had produced for themselves, this was a risk we were willing to take. I shot over an email for a rush job and they had these invitations printed and express shipped for me in less than a week. Absolute lifesaver! Gotta love small businesses. Their customer service was on point and their quality control is second to none! 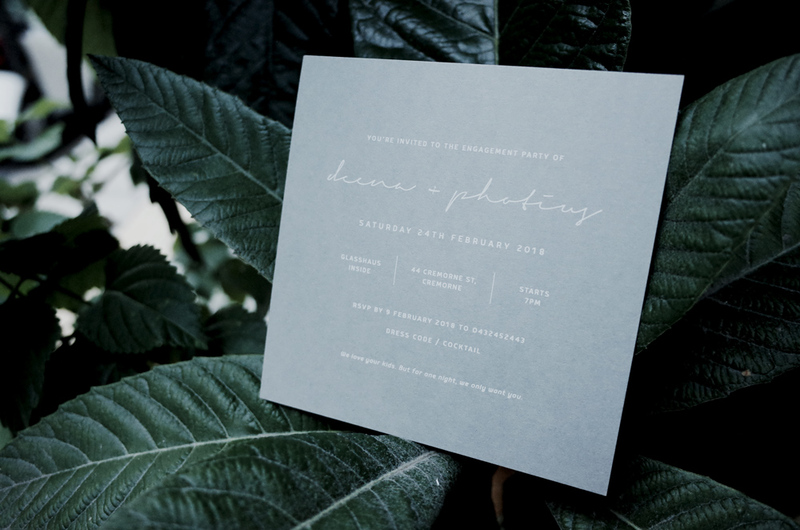 These olive green letterpressed and blind pressed invitations came out beautifully! Join our community of Australian brides getting married in 2019 to support one another on the journey to your wedding day. Share your ideas, ask questions and connect with other like-minded brides to be. Older PostStep Four : The Invitations cont.